A group of local business leaders and historians are teaming with the Oklahoma City Community Foundation to implement the 89er Trail, a set of 28 historical markers to be placed around the central core to commemorate Oklahoma City's unique history. 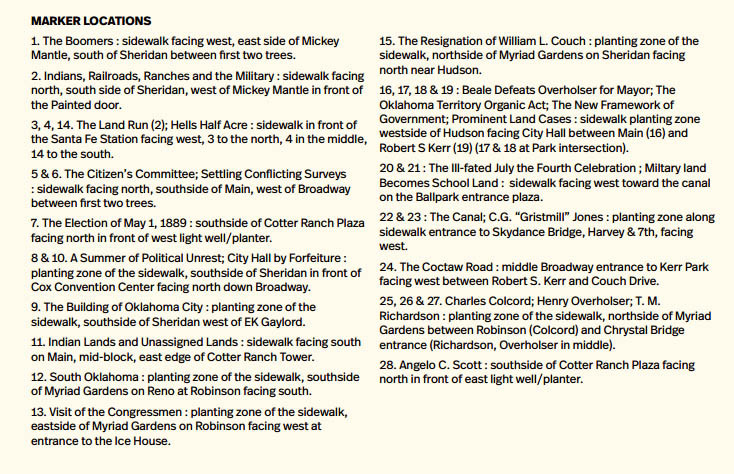 Most of the markers will be located in the Central Business District and Bricktown. “The markers will be placed along sidewalks and appropriate locations in and near downtown and will correspond with stories that happened on those sites. 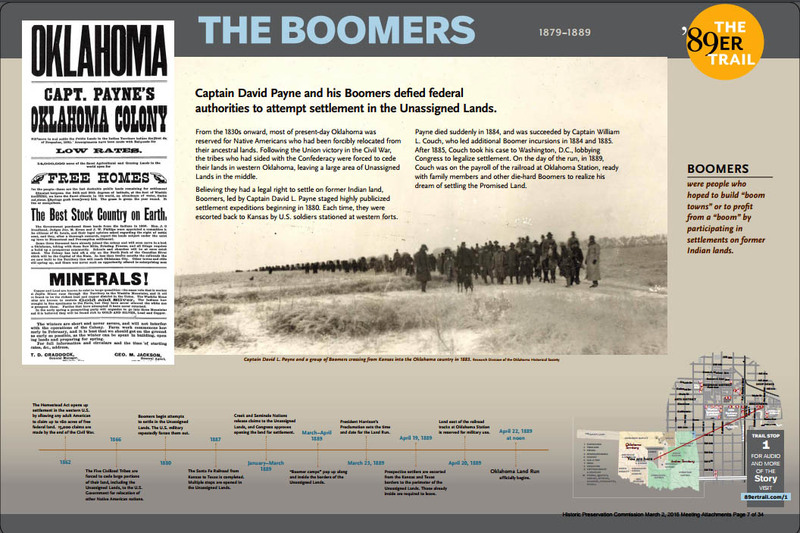 They will show where the settlers met to establish their provisional government, where pioneer leaders staked their claims, where surveyed streets and claims conflicted, how peaces was struck between the warring town site companies, and where early-day landmarks stood. 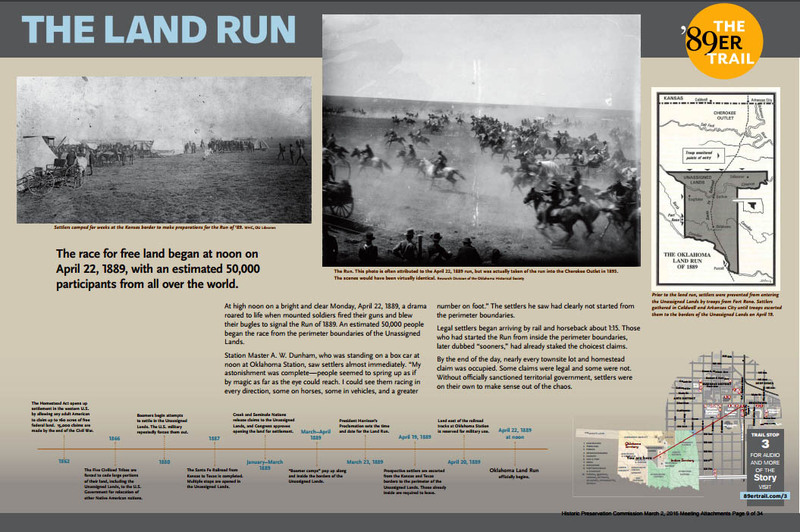 Markers wil tell a chronological story as well as individual stories about important events and prominent leaders. 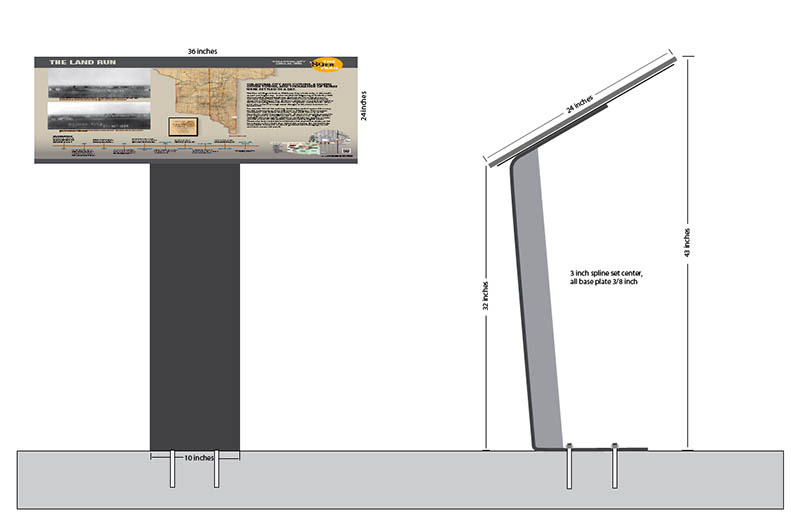 Each marker will have a number that corresponds to a web link that will provide additional photographs and narrative. The 89er Trail Fund has an editorial board featuring business leader and real estate developer Chuck Wiggin, independent historian Michael J. Hightower, Executive Director of the Oklahoma Historical Society Bob Blackburn, and librarian Larry Johnston. Chuck Wiggin will over seen the maintenance of the project through the 89er Trail Fund. The plan must first be approved by the Arts Commission, then various other design review committees in the areas of installation. Cool! Bob Blackburn has wanted to do something like this for decades. Glad to see it happening. 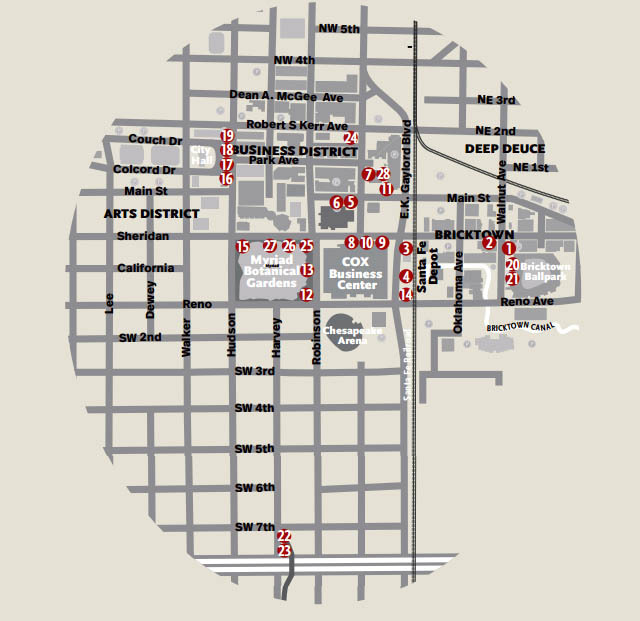 This project is now largely complete with the various installations all over downtown as outlined above. 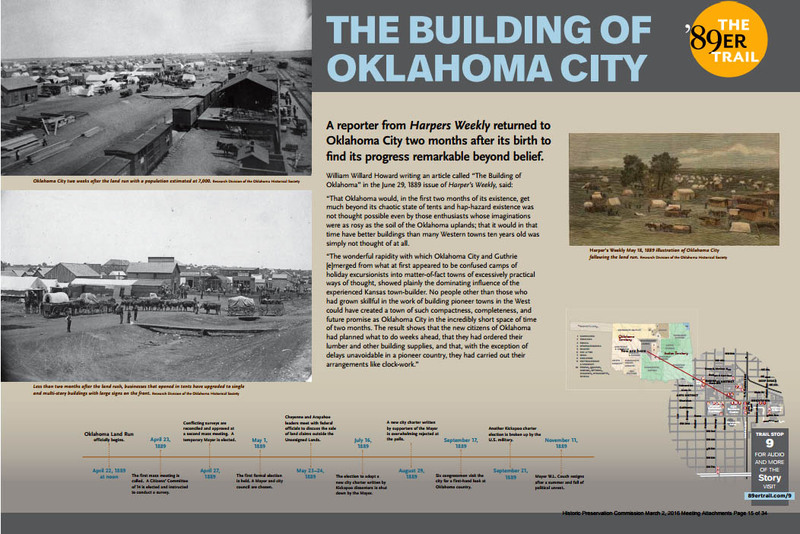 This is an excellent way to spend a couple of hours walking in downtown OKC and learning its history, including things that most people never knew. Our first mayor - William L. Couch - was a "sooner" who was shot to death over a claim dispute less than a year after the land run. Surveys weren't known until AFTER people staked their claims that first day, resulting in a one-in-three chance that your claim would turn out to be in a street or alley, and disallowed. 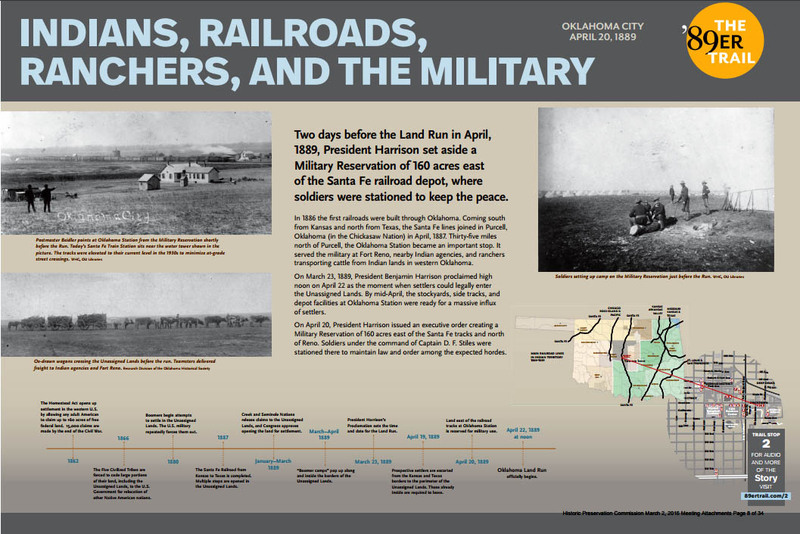 The Seminole Survey company failed to disclose a railroad right-of-way between 1st & 2nd Streets, so affected property owners lost rear portions of their lots where the tracks would go, and their compensation was paid by a temporary saloon tax. The early government was so fractious (the "Seminoles" v. the "Kickapoos") that federal forces had to step in and restore order 13 months after the land run.